The days are getting shorter, and that means that SATELLITE 2017 is getting closer, minute by minute. 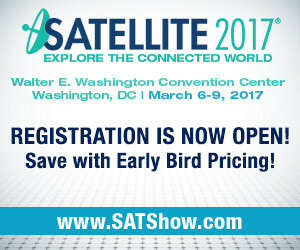 If you haven’t checked into www.SATShow.com lately, you should take a thoughtful coffee break with the conference website. Since we parted ways back in mid-March, the global marketplace for satellite-enabled services has continued to expand dramatically. Beginning with Early Bird half a century ago, this ability of the satellite sector to reinvent itself and remain a top player in the worldwide mix of telecom services has been its key differentiator. Arabsat CEO Khalid Balkheyour, Yahsat CEO Masood M. Sharif Mahmood, OneWeb CEO Eric Beranger and Hispasat CEO Carlos Espinós recently confirmed for the Tuesday afternoon general session, International Satellite Operator CEOs – Regional Focus. We have some very exciting news to share about our SATELLITE 2017 general session program! Here's a sneak peek at the first confirmed speakers. These sessions are included with your SATELLITE All Access Pass - register today before the Early Bird deadline expires! Stuart Daughtridge, Vice President Advanced Technology, Kratos and Marco Brancati, CTO, Telespazio will be joining our Monday Morning General Session Satellite CTO and Tech Leaders: Ground Segment Focus on Monday, March 6 at 8:30 a.m. Stuart, Marco and technical leaders from the largest ground segment companies discuss the future which begins with the end user and how to reach the large worldwide untapped users so they can receive low cost services from the new constellations and legacy systems. This session is open to all conference attendees. Thousands of professionals involved in connectivity, hardware, access to space, imagery/sensing and finance will be on-hand at SATELLITE 2017 learning, networking and experiencing next-generation technologies and solutions in an ever-expanding Exhibit Hall filled with more than 350 leading vendors. If you’ve waited to secure your exhibit space for the 2017 show, now is the time to lock in the best available location! Several prime locations are still available and are shown in blue on the floor plan. To reserve your exhibit space, download the exhibit space contract form and contact Michael Cassinelli at +1 (301) 354-1691 or mcassinelli@accessintel.com. Professionals travel to SATELLITE from all over the world, with representatives from more than 100 countries in attendance. While our world may be more connected than it has ever been, it can still be difficult to stay in touch with colleagues and friends throughout the year. With everyone gathered in one location, we want to make it easy for you to reconnect! The SATELLITE 2017 Welcome Reception on Monday, March 6 is open to all attendees! Dubai, 19 October 2016: Thuraya Telecommunications Company, a leading Mobile Satellite Services (MSS) operator and Ooredoo Maldives today announced an agreement to supply resorts and fisheries with mobile satellite products and services across the nation. The initial phase of the agreement will provision fisheries and anglers with voice products and broadband connectivity over Thuraya’s satellite network.